Home › Home and Kitchen › Silicone Baking Mat - Set Of 2 Half Sheet (Thick & Large 11 5/8" X 16 1/2") -..
Silicone Baking Mat - Set Of 2 Half Sheet (Thick & Large 11 5/8" X 16 1/2") -..
THICK/LARGE & MULTI-PURPOSE: Fits US standard half size baking sheets (16.5" x 11 5/8") - Mat thickness is 0.75 mm (approx. 1/32"). Perfect for baking, kneading, rolling, candy/macaron/pastry/cookie/bun/bread making as well as for freezing meat balls, dumplings, fruits and vegetables. OVEN/MICROWAVE/DISHWASHER/FREEZER SAFE - DURABLE & LONG LASTING: It's flexible yet tear resistant, and designed to withstand thousands of uses under extreme conditions of bitter cold and intense heat (from -40F to up to 480F). PERFECT, CONSISTENT RESULTS: Silicone/fiberglass hybrid construction helps to distribute heat evenly along the entire baking surface therefore you always get perfect consistent results every time you bake - no more burned and under-baked spots. Look at the pictures of the bread I cooked. It's perfect all around! Size: Half Sheet 2pk STOP EATING TONS OF CHOLESTEROL, SATURATED FAT & CANCEROGENIC SUBSTANCES PRODUCED BY COOKING OILS SUBJECTED TO HIGH TEMPERATURES! Instead of lubricating your baking sheet with oil & fat, make it nonstickwith Velesco Silicone Baking Mat! Not only does it eliminate potentially dangerous elements from your diet, butit also makes your life a bit easier and more enjoyable. Because once youfinish baking, all you need to do is to rinse the mat in warm soapy water,roll it up & store. And most of the time, you don't even have to wash your sheet. IT's ABSOLUTELY THE BEST BANG FOR YOUR BUCK! Save on cooking oils & fat! Stop buying miles of parchment paper! And save onbaking sheets & pans! The only reason why you trash them prematurely is because over time, they getdamaged by burnt sugar & fat, as well as by abrasive cleaning products. 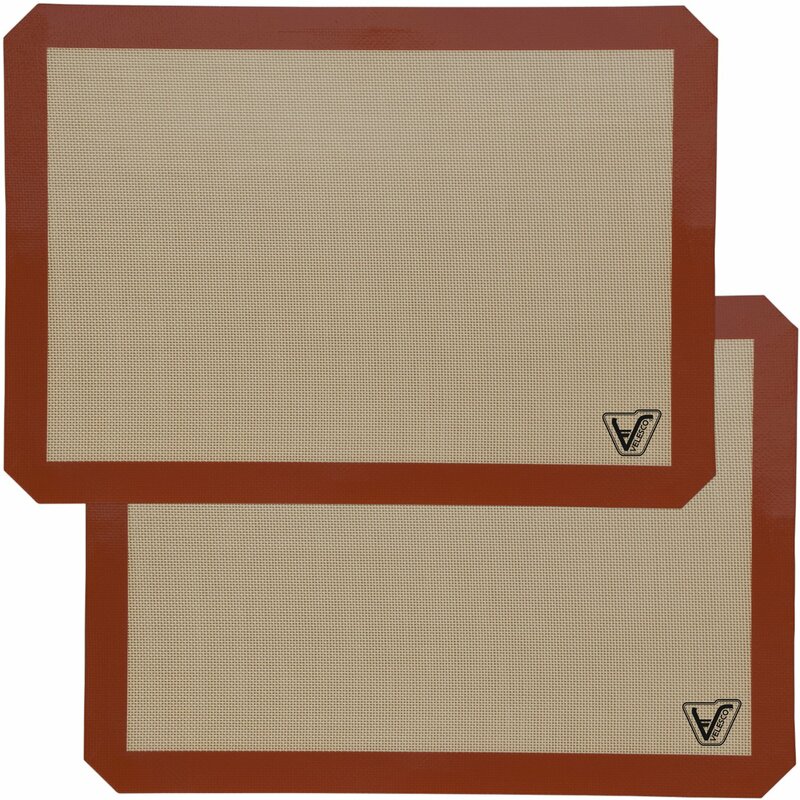 Our silicone baking mats keep all the nasty stuff away from your baking sheets& pans causing them to last much longer. HERE IS WHY PEOPLE ABSOLUTELY LOVE THESE MATS - 100% Non-Stick & Easy-To-Clean - Thick & Large - Perfect Fit for Standard Oven - Multi-Purpose - Baking, Kneading, Rolling & Freezing - Durable & Long Lasting - Good for Thousands of Uses - Perfect, Consistent Results Every Time You Bake - Oven, Microwave, Dishwasher & Freezer Safe - Food Safe, Non-Toxic, Hypoallergenic & Healthy - Eco-Friendly - Non-Toxic & Fully Recyclable - Saves Space - Rolled, It Takes Very Little Space BEST LIFETIME & 100% SATISFACTION GUARANTEE We are dedicated to your satisfaction. Shop with confidence! SCROLL UP & CLICK THE ADD TO CART BUTTON NOW!